Every now and then a beer comes along and reminds me just how much I enjoy the Dark Side: this is one of those beers. Struggling for a comparison, I came up with vintage port and a barrel-aged barley-wine, getting married in a burnt-out toffee factory. Pretentious maybe, but it fits. Produced by Denmark's Evil Twin Brewing – whose brewer Jeppe is the brother of Mikkeller's eponymous founder Mikkel – at De Molen in the Netherlands, at 8.9% this is almost a lightweight by modern Imperial Stout standards, yet it packs a big flavoursome punch. 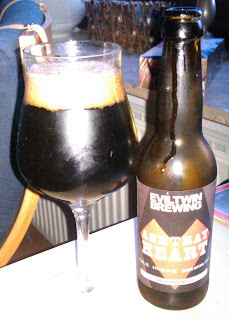 Ashtray Heart pours a deep black-brown with a big foamy tan head. On the nose there's smoke and malt, plus hints of roasted coffee and smoky bacon. In the mouth it's well-named – there's notes of ash, leather, old wine, black treacle and a faint tartness. Then in the finish, a little malty sweetness, a hint of roasted cocoa, and that burnt bitterness that tends to signify roasted barley. If you don't like smoked beers, you'll hate this. But if you like them, or if you're neutral to them but like strong stouts and porters, I suspect you might love this. Beer for BBQs - decisions, decisions.